Sometimes it can be difficult to gauge what an outsider thinks of our sustainable lifestyle, and how they can adapt to sustainable living in the ‘burbs. Are we perceived as new aged hippies, or just people with a quirky outlook, or neither? So luckily during this episode of the podcast, we get the opportunity to see if our way of living rubs off on our visitors who drop in occasionally and what they think of it. 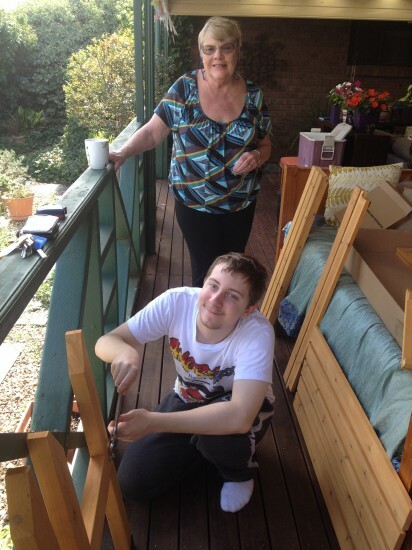 So to that end, my special guest is Pam Dawson, my Mother-in-law. She lives in Southampton, Hampshire, UK. However, she has been staying here at TGoG urban farm for the past five weeks and I was interested in her opinion of how we live, what she likes best about it, what she doesn’t like, and what lessons she is taking home with her. The chat was insightful, even though a little bit biased. After all, she is the mother of my wife, Kim, and lovely at that. Maybe I didn’t work her hard enough around the garden? Seriously, I really appreciated all the help she gave us during her visit, and couldn’t thank her enough for volunteering as a guest on the show. Thanks Pam. So make yourself a cuppa and please take the time to have a listen to our little chat about her experience of sustainable living. I believe you will enjoy it. If you enjoyed the podcast, please pop over to iTunes and rate it or leave a review. You can also do the same within Stitcher Radio if you use that service. It would help me out so much, and elevate the ratings so that others can find the podcast and learn about sustainable living in the ‘burbs. Until next time, stay green and keep keen! Please thank Pam for coming on the show. I am humbled to announce that my green transformation story features in another national magazine this month in an article titled Everyday Green Hero. 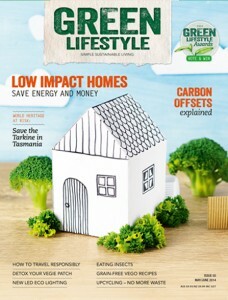 The publication is Green Lifestyle Magazine, and is a profile written as part of the 2013 Green Lifestyle Awards. Not one to blow my trumpet (much), I am very pleased with the two page article written by Tierri Abraham, which featured in the May/June issue. She captured the essence of our journey to date. I conducted the interview a few months back via email, and answered the questions sent to me to the best of my ability. Not a bad way of conducting an interview by the way, because I could really think about the message I wanted people to read. Hopefully it comes across okay. 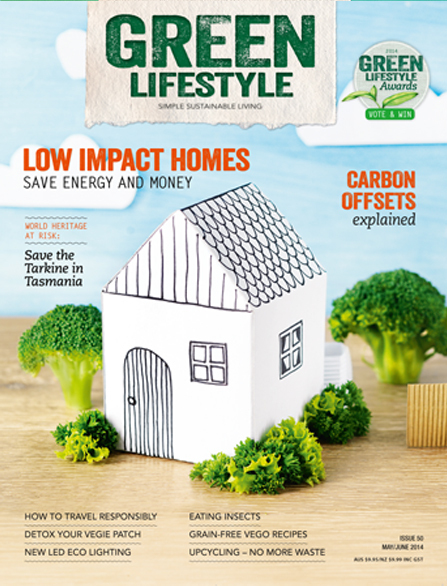 I have purposefully cut off the story in the image due to copyright, so if you would like to read the story, I am sure it will surface on their website soon, www.greenlifestylemag.com.au, or better still, visit your local newsagent and buy a copy or subscribe online. If you are worried about the paper and the carbon emissions from the magazine’s production, rest assured that the text pages are printed on 100% post-consumer recycled stock, and the cover is 45% FSC certified fibre and 55% recycled post consumer waste. All manufactured Process Chlorine free! Additionally, Green Lifestyle purchases carbon credits to offset the magazine’s greenhouse gas footprint. While we are talking about carbon credits, there is a really good article in the magazine about Carbon Offset Basics, written by my buddy, Greg Foyster of Changing Gears fame. The article is well written and is now my go-to reference for carbon credits. In fact the entire issue is well-rounded and very informative. Worth a read, if I do say so myself. 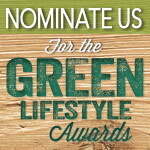 While we are on the subject of Green Lifestyle Awards, the 2014 Awards are now open for nominations. If you think this blog The Greening of Gavin is worthy for an award nomination again this year, please pop over to the nomination page to submit your nomination. Select the Nominate a business, producer or service that I have used button and may I suggest the Online Eco Info Site category if you are struggling to select one? If not, no problem at all, but take some time to nominate your favourite green business or person while you are there. There are so many to choose from that are doing great work. Just by submitting a nomination you could WIN a four-night stay at Paperbark Camp, valued at over $3,000! Sounds like a very cool prize. Anyway, I am a firm believer that if you don’t ask, you don’t get. As always, thanks for reading. I appreciate each and every one of you for dropping by the blog, day after day, year after year. You are my inspiration! 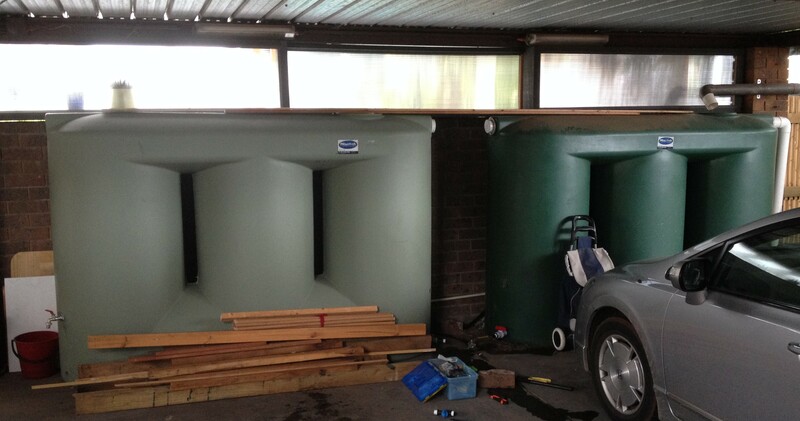 One of my goals for the year was to buy and install a third rainwater tank. After a few good months of saving, I had enough to call up the tank manufacturer in Ballarat and order one. We got it delivered a week before Easter, so as it was raining, I thought it best to connect it right there and then. The connection was a shocking job, and I rushed it. So I decided to redo it over the weekend. The new tank is on the left. Don’t ask me why we ordered a different colour. Okay, I will confess. During the ordering process, Kim and I were convinced that the original tank was the light green colour, and as it was dark and cold we didn’t bother to check. Our bad, but not to worry because it still holds water and that is the main thing, isn’t it? So on to the connecting business. The dark green tank was already connected through to the irrigation systems, so I disconnected it all. 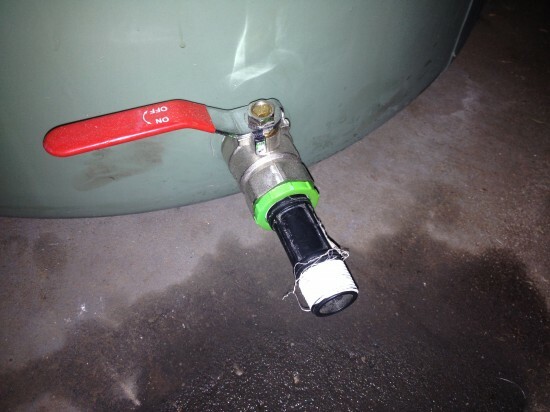 I have seen some people connect the tanks at the top through the storm water drain outlet, and this does work, however the light green tank is slightly higher than the original tank, so this method would not have worked (water doesn’t run up hill). The only option I had was to connect at the bottom via two taps and some pipe. I drilled a whole in the bottom, through the threaded hole, with a 22 mm spade bit. The hole is 25 mm, so the smaller spade bit ensures that you don’t strip the thread away. It is a fairly simple exercise, because there is a small guide hole for the tip of the spade bit. I removed as much of the plastic waste as possible back through the hole. 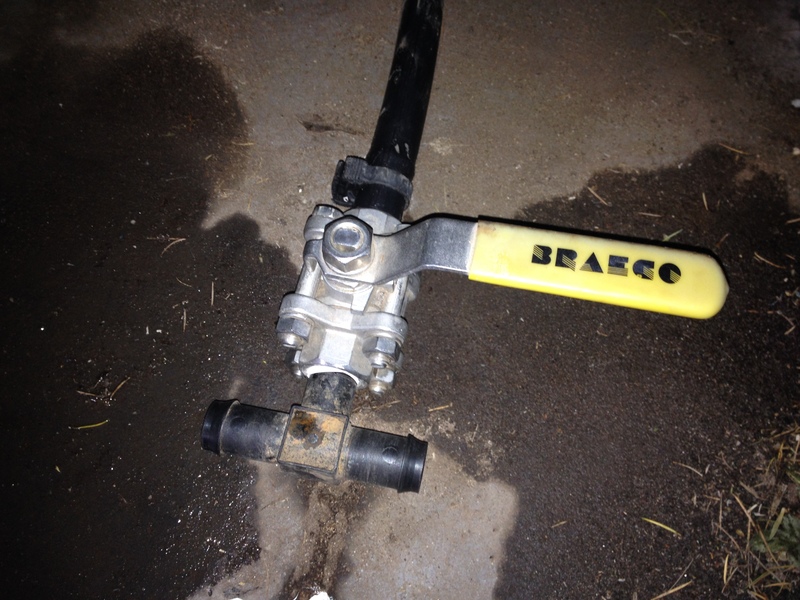 I then lined the thread with teflon plumbing tape to stop any potential leaks via the thread, and screwed in the tap. I then fitted a reducing thread to get it down to a workable 20 mm, which is the right size for most garden fittings. With more teflon tape, it was ready to connect to the original tank. Note; the water on the ground is from when I disconnected the two tanks to make these modifications. 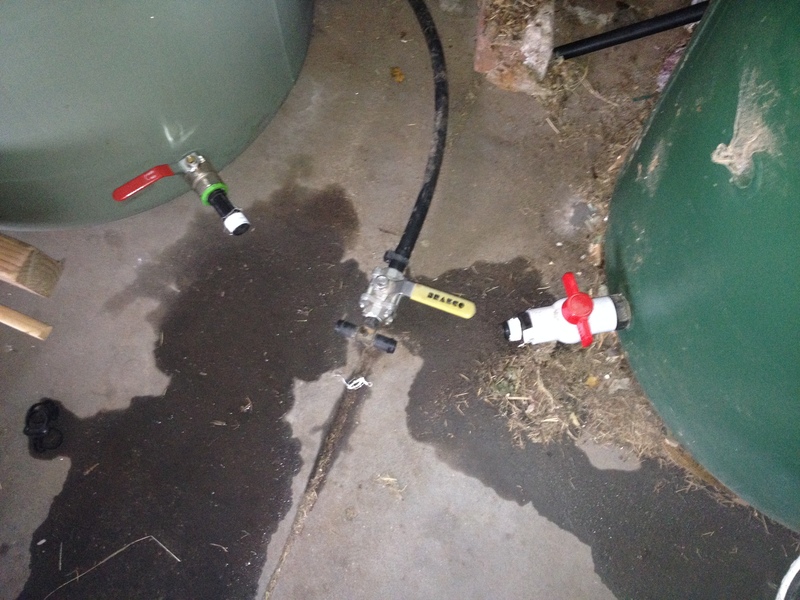 Then I had to work out a way to balance the two tanks without all the water going into the garden. I found an old tap in my box of tricks. 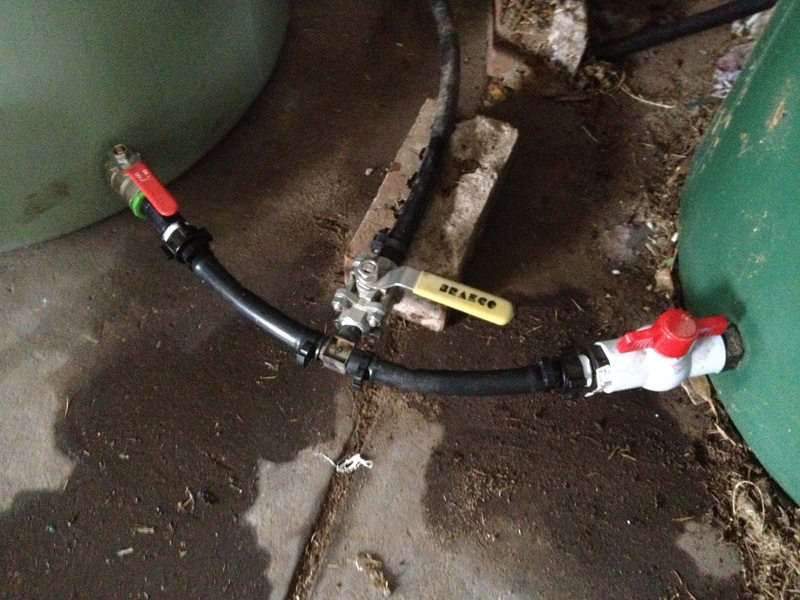 I think I recovered this when I unplumbed the original irrigation system when we first moved in. I keep most things like this, because a) they are expensive to buy, and b) you never know when you are going to need one! I fitted a T-piece that had a 20 mm thread, with two 19 mm barbs. 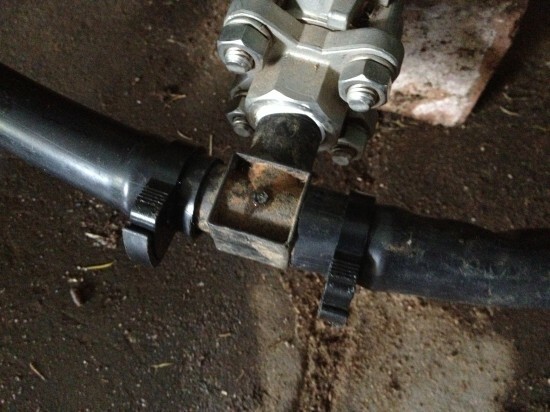 Then I pushed in two pieces of 19 mm poly pipe and clamped them. I then measured the correct length for each pipe, then cut and connected to two 20 mm threads with barbs and clamped again. It all lined up perfectly. As you can see above, with the main line tap off, and the two tank taps on, it balances the water from the dark green tank to the light green one on the left. The dark green tank is the one fed from the gutter, as I have only fitted one down pipe from the gutter. This is just simply magical. The yellow tap stops the water flowing down the main-line when balancing the water. Just one word of caution. This is not pressure pipe and should not be used for normal plumbing installations, as it may burst. The water in the tanks is not under pressure, so this is a fairly safe setup. Besides, when not in use, I turn off both taps on each tank. I have only been balancing the tanks when it has been raining to avoid any issues. If, some time in the future that I wanted to plumb this into the toilets or laundry, I would use a plumber, who would use the correct pipe. So there you have it. Two connected tanks, we have increased our water storage capacity by another 2100 litres, and not a leak in sight. I am very pleased with my efforts. As with any project, if I can do it, anyone can! 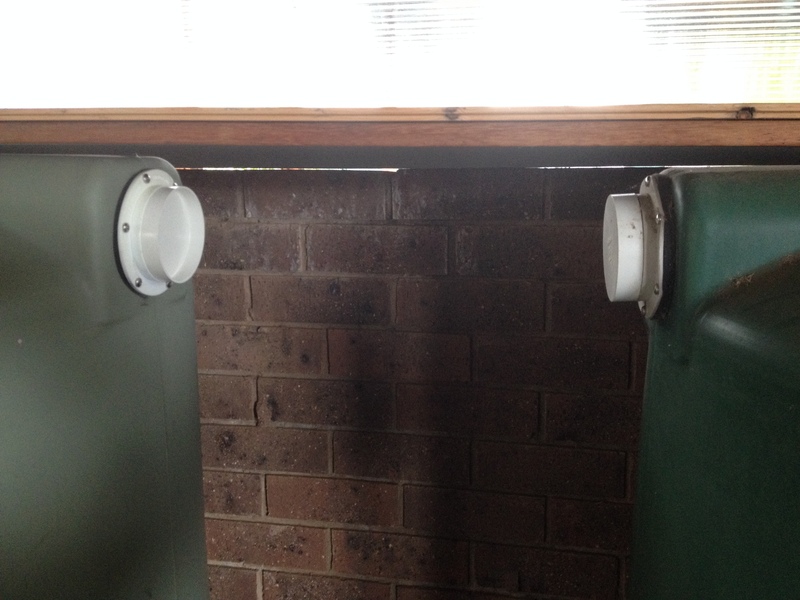 Connecting two rainwater tanks is easy. Now I have to figure out how to reconnect all those small water barrels back into the system. I better get my thinking cap on. Can anyone think of a good use for small 100 litre water barrels?